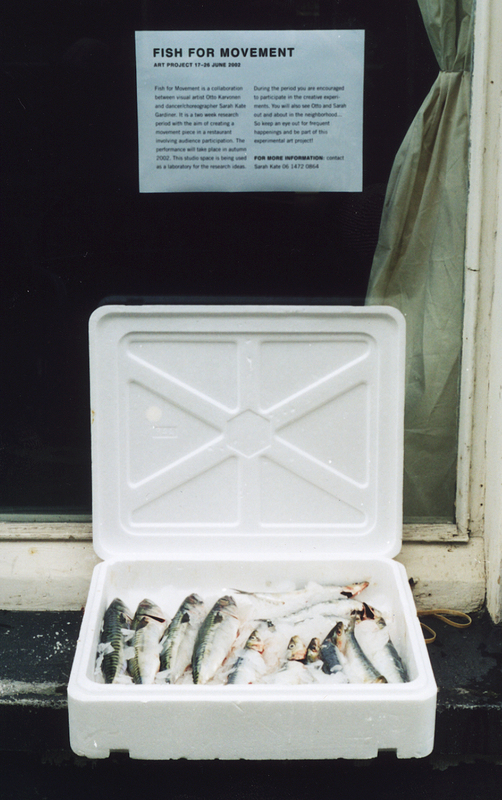 Fish For Movement is an artist residency in an empty shop leading to a series of neighbourhood experiments, interventions, and performances, in collaboration with Otto Karvonen and Sarah Kate Gardiner. During one month the two artists from a background in visual arts and dance explore the idea of exchange in the frame of a restaurant. The shop shifts identities as fish is exchanged for movement with local passers-by, building an archive of short choreographies. In the final performance the audience become the shop window display, facing out to the public space, these spectators sink further into noticing the details of lifes theatre on an ordinary street where figures and poetic interactions emerge and dissolve back to daily routines. During this roller coaster of experiences the audience are locked in to be left with a plate of only lemons, only fish, salt or cutlery and of course each other. How and will they decide upon a democractic exchange? On a full belly they are joined by dancing waiters who collect orders, not of food but life questions, shortly after to be served answers from a neighbour across the room. Plates are cleared in rhythmic precision, tables are reorganised as are the customers to create a catwalk competition for the most skilled waiter twisting, turning their dancing skills with tray confidently in hand! Fish For Movement was generously supported by the Arts Council of Finland.